A lot of Easter chicks have hidden throughout the Harmony United website. 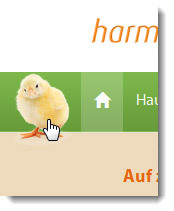 The first chick is at the top of the homepage below the Harmony logo. There are more Easter chicks to be found on other content pages and product description pages - they are either visible at first glance or you will have to scroll down to find them. There is just one chick per page, but not on every page is a a chick. The maximum number of chicks that you can cash in the Harmony Shop is ten. (We have to leave some over for others who may start later). Every chick that you find up to the maximum of ten gives you an additional 2.5% discount on your purchase. This will be shown in the shopping basket as you confirm your order. Please note: The duration of the action is guaranteed. If, however, the planned quota looks like running out, then the discount will be reduced from 2.5% to 2.0%, 1.5% or, subsequently, even to 1% per chick. At this time of the ancient fertility festival, permanently add zest to your life and return to your natural, healthy condition. If you've been toying with the idea of going for one of the giant sets, then this is your Golden Opportunity. The same package is also available with 2 Harmony Pendants instead of standard Evolutions. This is your perfect combination for beginning of spring. 2 Minis to pep up tired feet on extensive hikes and 1 Harmony SuperCharger for your car or motor bike. These special Easter packages and the Harmony Auric are excluded from the Easter Chick Hunt and can not be discounted further. The offers will remain valid until midnight on Friday 6th April.